Logbook of Winged Monkeys: 17 000 feet. Review from Winged Monkeys Paramoto Team. All the flights outside F and G zones must be approved with air traffic control. Do not fly without oxygen at altitude over 14 000 feet. Do not endanger your own and others lives. We were considering doing high altitude flights for quite a while. Eventually we were lucky enough to get both the permission from local air traffic control and some good weather to do the flights. The idea behind these flights was just to have fun (not to set any record) so we used the same Apco Lift wings we fly every day and no tuning was done an ordinary moster 185 on a SkyMax frame with S-horns and 125mm Helix prop. We were really surprised with the outcome so here is the review of the flights. Highest RPM at the ground level were 8350 and the climb rate was just about 3 – 3.5 foot per second. We made the first 3000 feet in approximately 12min. RPM was going down slowly, at 12000 feet highest RPM was 7700 and about 1.5 feet per second climb rate. So the RPM drop was around 550. In comparison to Moster, under the same circumstances Simonini mini 2 engines lost around 1500RPM and the climb rate stopped at 12000 feet. At the altitude of 12800 feet I suddenly got into wide, around 600 feet in diameter ascending airflow. The Climb rate jump to 3 feet per second. At 14200 feet. Moster is still perfect. At 14800 feet I Am still getting 7500RPM. Initially I expected to be able to get to only around 12000 – 13000 feet but now I was hoping to reach 16400 feet (5000meters). 14 800ft, the views are amazing. However the symptom’s of hypoxia are building and getting stronger. Getting the sense of having not enough air first appeared at 12 000 feet and is now increasing. After being in Chilean Andes and having been exposed to these symptoms I knew what to expect. 5000 meters (16400 feet) notch is getting closer and closer… Got it! As you can see at the video, emotions are overwhelming. At this point I made a decision to go higher until I run out of fuel. Climb rate at this altitude is about 60 feet per minute. Moster surprises me to no end – I still got 7300RPM, which is fantastic. At the same time, the symptoms of altitude sickness were getting worse as time went by – breathing difficulty had gone and my mood was getting higher and higher. Having previous experience with these symptoms I knew that I had to stop shortly. Meanwhile the fuel runs out. Silence… Incredible. My Brauniger IQ Alto shows 16961feet and Garmin GPS shows 17552feet. I did not want to spent too much time at this altitude and pressed out the speed bar. Descent rate was 20 feet per second to 30 feet when doing light maneuvers. 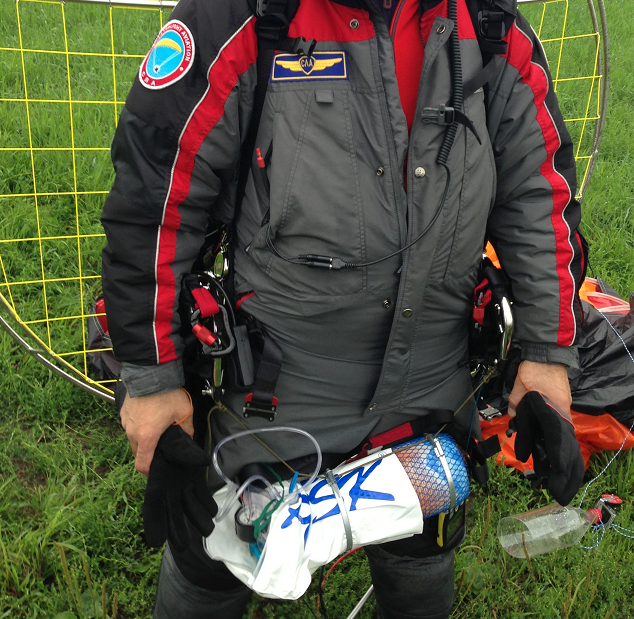 At that altitude I did not want to take the risks of doing spirals – with low oxygen the risk of passing out under G-force is significantly higher. my leg muscles were shaking making it difficult to press the speed bar. From 11500 Feet I starting doing spirals. On this 1h 46 min flight I used 12litres of fuel, with average consumption of 6,8l per hour and average climb rate of 2,6 foot per second with Apco Lift M (28m). I was really impressed with how Moster 185 handled altitude performance. I was in the mountains at the same altitude and knew what to expect. 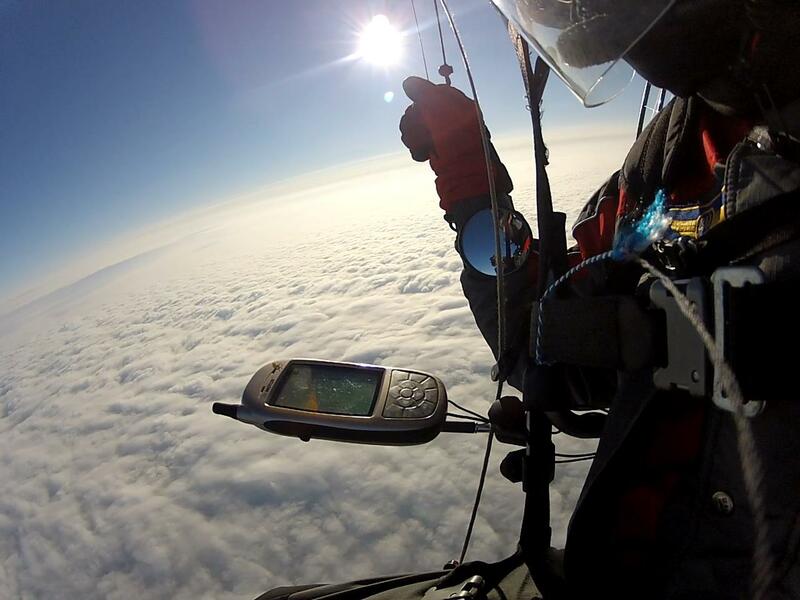 Using oxygen for flying over 14 000 feet is a legal requirement when piloting a plane and we strongly recommend to do this with paramotoring. The next flights were done using oxygen. The idea was to explore how it all works and to get ready to fly in the mountains.For our paramotoring purposes oxygen systems designed for climbing mountains work perfect. They are light and are used in the same conditions we are flying in. 1. The tank. For paramotoring a 2–3 liters tank is more than enough. 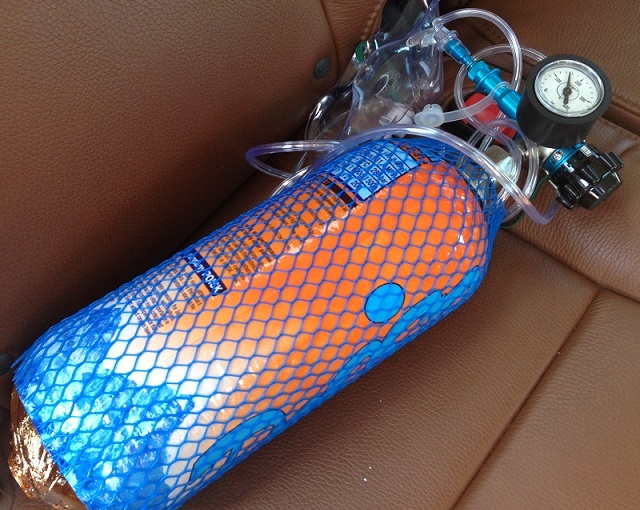 It provides a pilot with oxygen for 4–8 hours depending on oxygen flow rate. The weight of such a tank is only 1–1.5 kilo. It is made of special polymer and holds the pressure up to 300ATM. 2. Air flow regulator with oxygen flow settings from 0,5 to 4 liters per minute. 3. Mask. We used the most simple type, the same you have seen in the hospitals. Few tips on how to mount the tank to the motor. The first thing you have to consider is that during the flight you have to be able to reach the air flow regulator and see the notches of the flow rate. Therefore we decided to mount the tank to the cockpit’s place in front, between the S horns. The second thing is that Oxygen is quite a dangerous gas, and you have to avoid any contact of the tank and its regulator with oils. As we have the fuel tank just one foot away from the oxygen tank we decided to use a simple but effective solution a plastic pocket with sealable upper part was put over the tank. However if I would use it on a regular basis, I would find a proper holder for it. Start with the tank is no different to ordinary one and there is nothing special about using the mask while flying. Oxygen does the job indeed. At 14700 feet I decided to do a test. I took off the oxygen mask for a few minutes. The difference is tremendous. In comparison with flying and breathing oxygen, it feels like you are drunk. High altitude flying is a stunning, marvelous experience. But in order to do it in a right and safe way, using oxygen is a must.